Apple Search Ads Filters: Growth Boosters. Filters are an efficient method of Apple Search Ads optimization. They are basic, yet powerful, as they can provide revealing insights and help identify areas for improvement. This is particularly relevant to large ad accounts with thousands of keywords, where it is so easy to miss important things. Let’s discover what they look like and how they work in our platform. The good news is that if you have experience with Google Ads, you’ll probably find some things familiar. 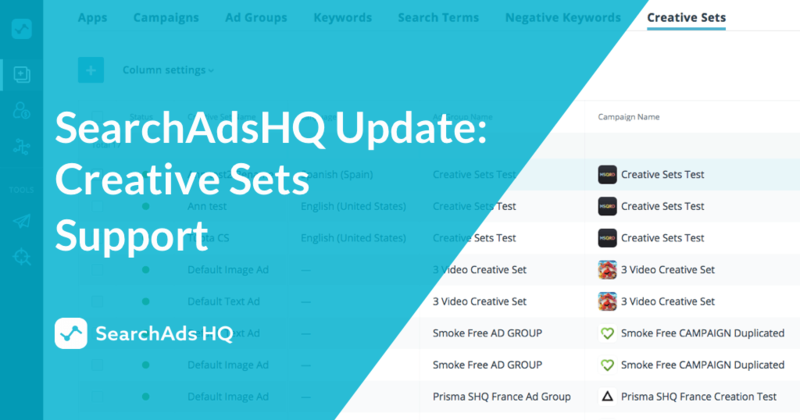 In SearchAdsHQ, filters can be applied at any level of the navigation structure Campaigns → Ad Groups → Keywords → Search Terms → Creative Sets. Account structure filters. They help easily localize the necessary data, for example, keywords associated with particular campaigns, or view all the enabled creative sets within a campaign. In fact, our navigation is built in such a way that you can easily perform drill-down/roll-up and slide/dice operations. Settings filters. These filters allow you to segment data. For example, you can obtain data for a particular storefront or find all the campaigns that have the word ‘Brand’ inсluded in their name. 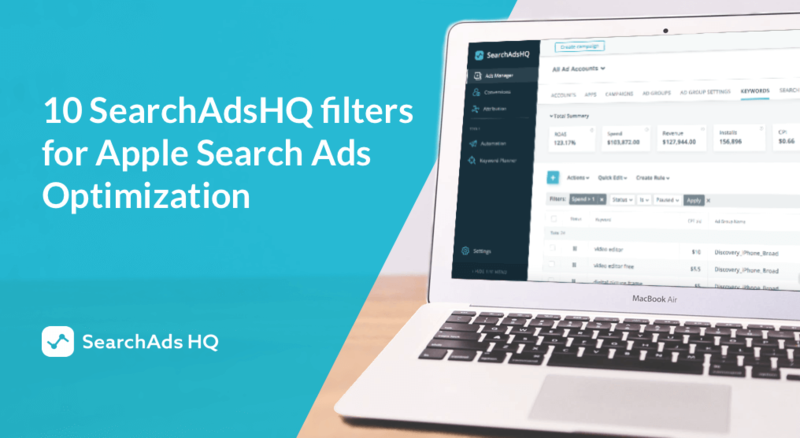 Typically, these filters help identify the logical segments in your account, such as different audience groups, Brand and Competitors keywords or different match types (Exact and Broad), etc. Metrics filters. The most common and straightforward type of filters. They help find all the ad groups with the spend greater than $500 or all the keywords with TTR less than 10%. Note: In rage / not in range options use inclusive bounds. Before we have a closer look at various filters, let’s define three basic restrictions. The time range to be used for analyzing data can differ from app to app. The main idea is to ensure that we have enough data to make a decision. In the example below, we use data for the last 60 days. This time range guarantees that even low volume keywords gain enough impressions for us to receive statistically significant results. 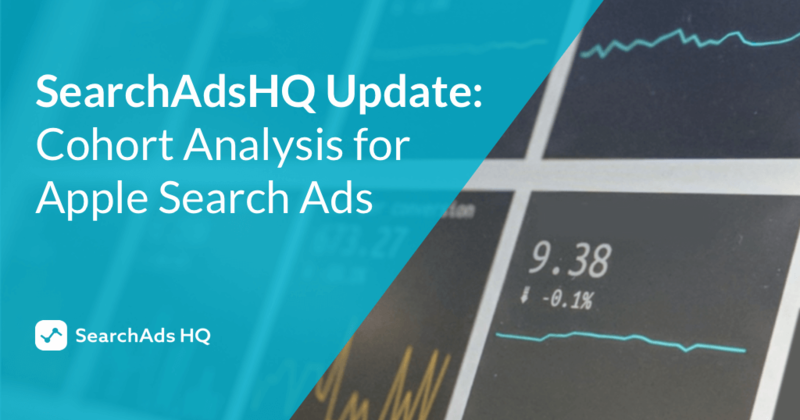 In most cases, Broad Match keywords are used in Discovery campaigns to search for new keywords, while Exact Match keywords are used for campaign optimization. Exact Match keywords give you the most control over your spend and help avoid the dilution of statistics. That’s why we will use Exact Match as an additional restriction for some filters. It’s all about sorting. We recommend to sort by spend to determine and pay attention to the most expensive keywords and groups, and by impressions, which can help potentially scale the impressions volume. By doing this, you focus on what can maximize the efficiency of your Apple Search Ads campaigns. Our research has revealed that the average tap-through rate (TTR) is approximately 7%. As a rule, however, TTR is higher for Brand campaigns than for Competitors campaigns. 5% (used in the example above) is a threshold level, and if TTR is below 5%, then the ad group performs worse than it could, and you need to find the reasons why. Low TTR indicates that there’s low relevance between a keyword and a creative set. By optimizing your ads, you can improve this score and thus get higher TTR. 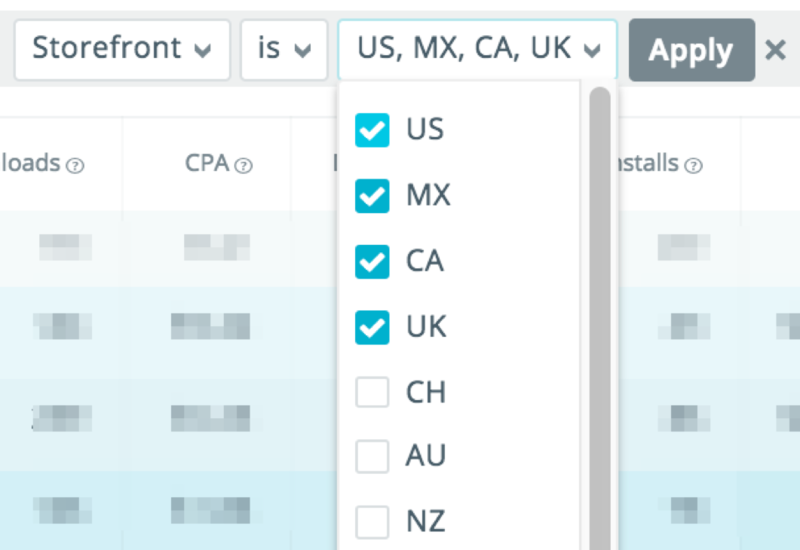 Localize and adjust your app metadata to specific storefronts. Exclude segments with poor performance, for example, disable non-working hours or weekends. Similar to the filter above, groups with low Download Rates show the areas that require optimization. According to Apple, the average Download Rate is 50%. The example above includes a more conservative rate of 30%. Creative Sets use the assets on your App Store product page, or metadata, such as texts, screenshots, icons. Thus, by optimizing metadata you can improve the tap-through rate of an ad (TTR) and the number of downloads (Download Rate). Optimization techniques are very similar to those in point 1) and are often used together. Some elements have a bigger impact on the TTR of a creative set (icon, name, rating), others on the Download Rate (screenshots, description). A different approach to counting installs that MMP has, compared to Apple Search Ads. Keep in mind that installs and conversions have a delayed effect, meaning that users do not always tap and buy on the same day. Analyze the data for the previous periods: they will typically show a higher rate. Woosh!... 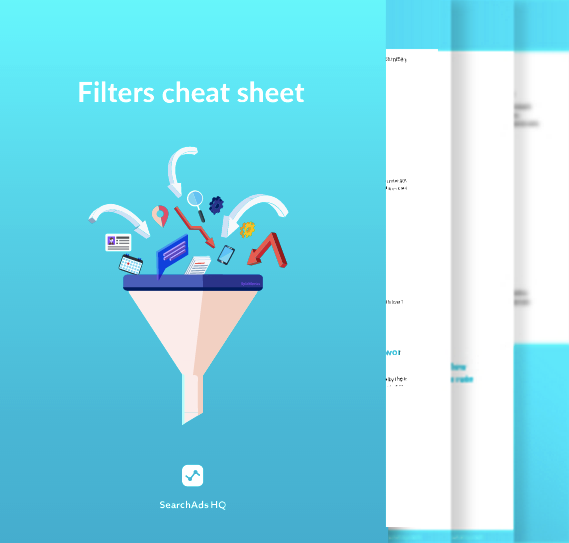 We’ve sent you the Filters Cheat Sheet! Apple Search Ads functions on an auction basis. For your bid to enter the auction, your app should be ‘relevant’ to the keyword that was matched to a particular user query. This is called ‘technical keyword relevance’. Apple’s algorithm determines this relevance based mainly on your app category and metadata — title, subtitle and keywords. How to count the share of keywords with low technical relevance? 3. Divide the number of keywords with few/no impressions by the total number of keywords: 17,211 / 23,085 = 74.6%. If this share exceeds 85%, then only 15% (or less) of keywords get impressions. Now let’s explore some filters that help identify the keywords that drive your spend up. 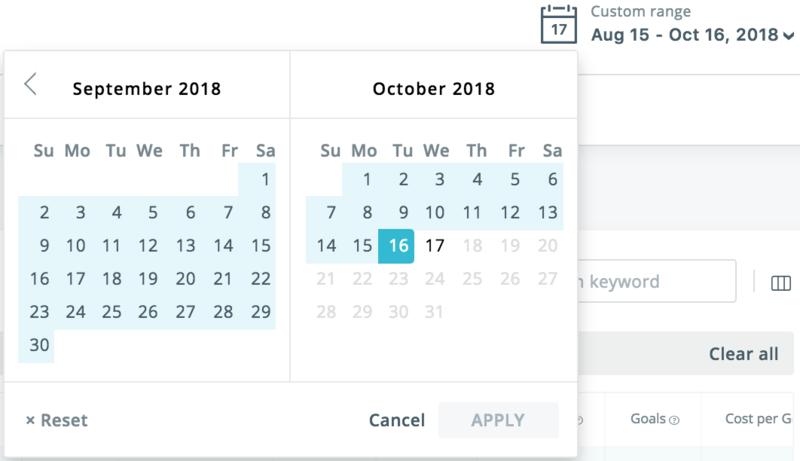 To find keywords that never convert, set the Spend filter above your threshold and Goals at zero. What can be done? Pause such keywords and/or add them to Negative keywords because they waste your spend. Filter out the keywords with at least one Goal and CPG > Target CPG. For example, if your Target CPG = $20, set CPG > $20. What can be done? Decrease CPT Bid by 10-20%. Some handy filters help discover the possible ways to scale the impressions volume and maximize revenue. Let’s discover them! What can be done? Increase CPT Bid by 10-20% for such keywords or move them to a separate ad group with higher Budgets & Bids. What can be done? Analyze why these keywords have such low TTR. The rate may go up if you pick a more relevant Creative Set. Another solution is to conduct A/B testing to reflect the keyword themes in the app metadata (copies, visuals), if possible. What can be done? Is it relevant to you? If no, pause such keywords and/or add them to Negative keywords. If yes, pick up a more relevant Creative Set or conduct A/B testing to reflect the keyword themes in the app metadata (copies, visuals), if possible. Apple Search Ads offers two Match Types — Exact and Broad — which work differently in Search Ads and Google Ads. In addition, the Broad Match type is quite aggressive and matches not only the close variants of a keyword, but also irrelevant search queries which the system considers synonymous. 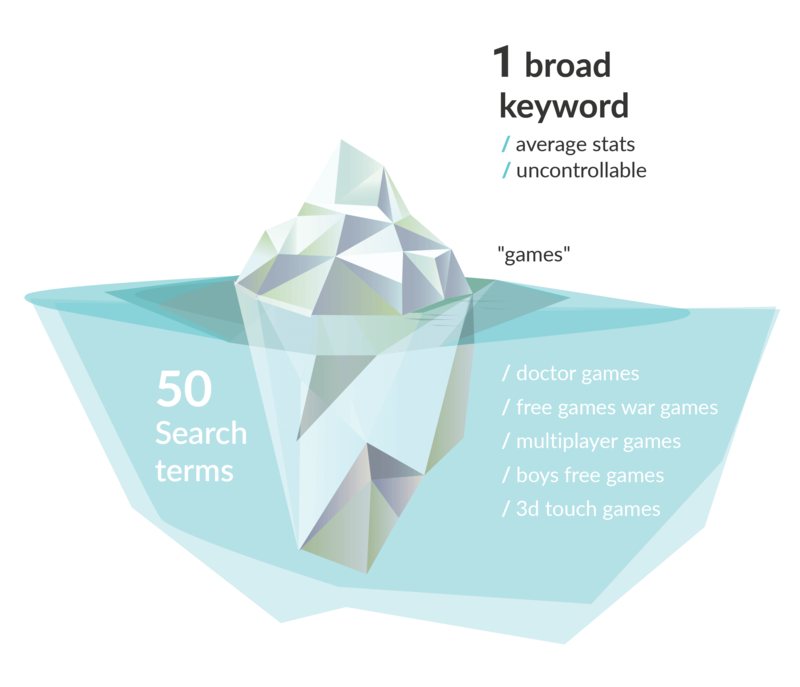 As a result, several keywords may end up competing with one another for a search query. 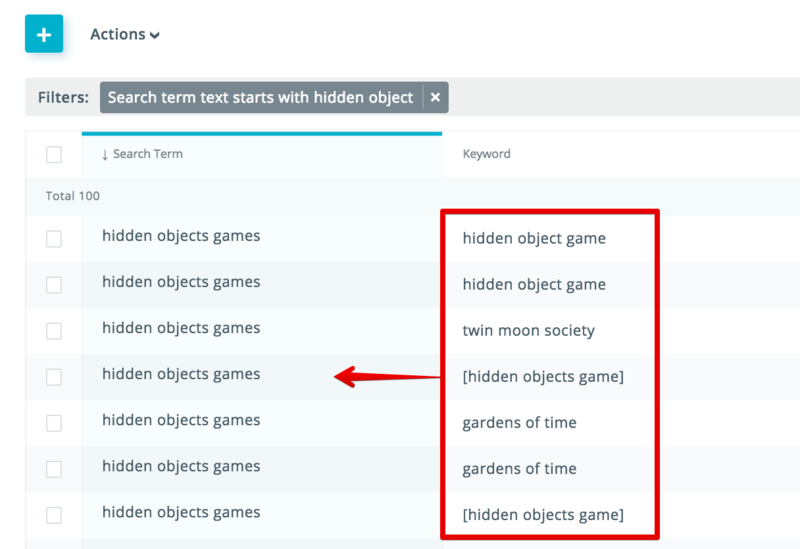 As you can see in the screenshot above, 3 different keywords of two different Match Types have generated one search term ‘hidden objects game’. Apple eliminates competition within one iTunes Connect account, in other words, the overlap doesn’t affect the cost. However, it dilutes the statistics, which makes it difficult to assess the real performance of a keyword. 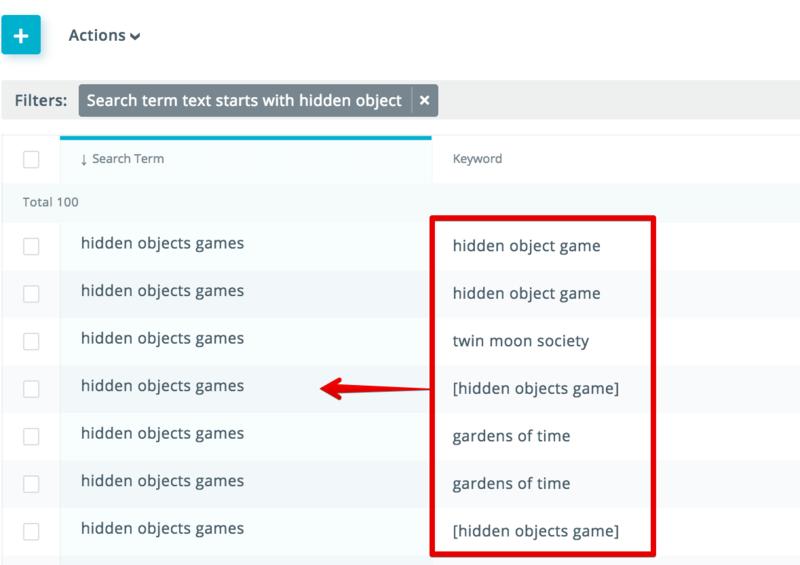 All the search terms are spread across different keywords, so the chances are you can either underestimate or overestimate the keyword performance. Use Negative keywords to eliminate competition between keywords in the Discovery and Exact Match groups. SerchAdsHQ filters can efficiently be used for bulk optimization, or overall automation of account management. The system will automatically apply the filter and show all the keywords for the selected campaigns. It doesn’t matter which account or app these campaigns are associated with. 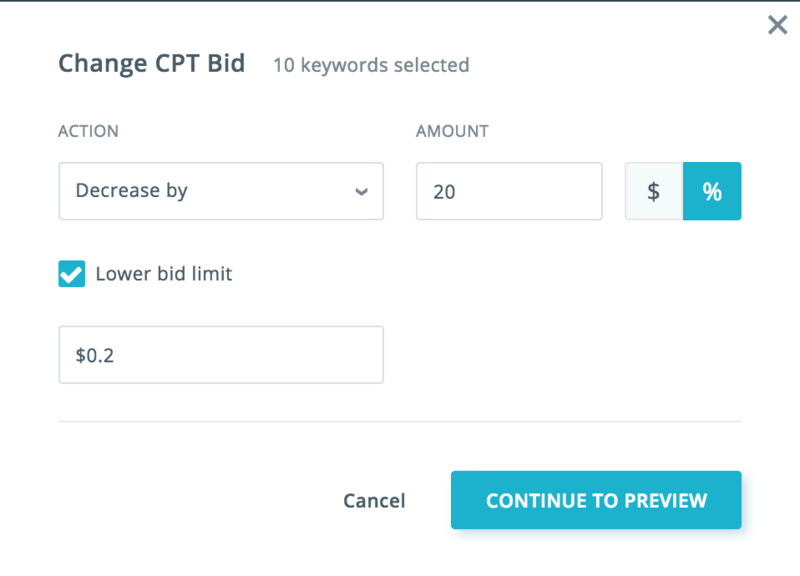 Filter out enabled Exact Match keywords with conversions and Cost per Goal above the specified threshold. In our case, it’s $20. Filter them by spend to see where you lose. These keywords don’t fall under your goals (Target CPG). One of the easiest methods to boost performance and reduce spend waste is to lower bids. Let’s reduce them by 20%. Select all the needed keywords. There are 10 in the screenshot below, but there can be more. 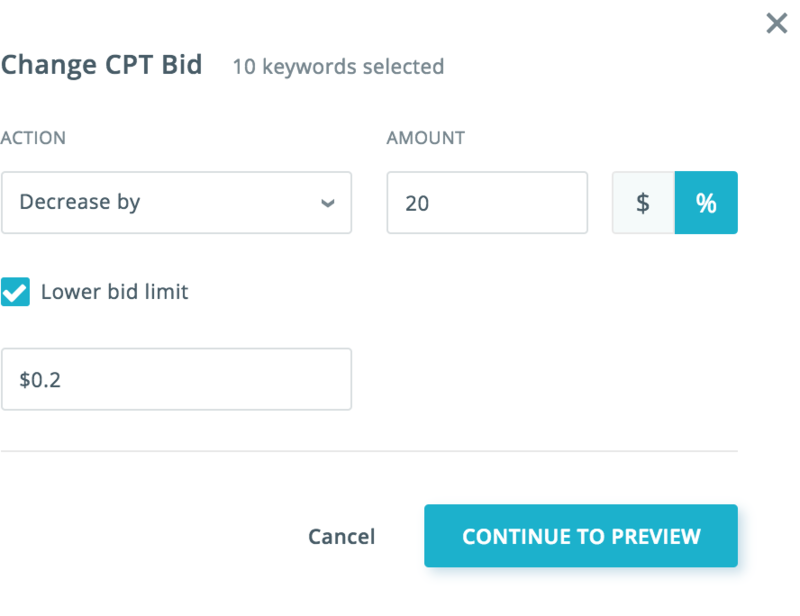 To change bids in bulk, choose ‘Quick Edit’ and go to ‘Change CPT Bid’. Select the required options. If you don’t want the bid to be under or over a certain threshold, set a lower or upper limit. 5. Choose ‘Continue to preview’ to make sure that everything is correct and apply changes. They immediately synchronize with your Apple Search Ads account. You can go even further and fully automate this flow by using SearchAdsHQ automatic rules.